After what seemed to be a successful install via wubi I am unable to login to the system. Aborting journal on device loop0. Were you by any chance using an amd64 image on VMWare? No, this was / is on real hardware. This is from a crash when booting into single user mode. Same issue here. I installed wubi x86_64 many times on a XP Home NTFS system and it always booted with / mounted read-only. Also tried the x86 version with same result. Sometimes I got a shell in single user mode, but not usually. Does mounting the same windows partition in r/w mode from within a standard Ubuntu installation work? Can you also run ntfs-3g.probe? Got the same problem. Got everything working, then I did the update as requested by the Update manager. DL and installed all updates and after that it wouldn't boot properly. Receiving more reports on this one. Still need more info to track it down. I no longer have access to the problem machine (until August). I'll try wubi on a couple other windows machines I have permanent access to. * Up to run-init everything seems good /host (ntfs device) is rw and /root (ext3 loopfile within ntfs filesystem) is not, which is correct since /root will have to be remounted rw by checkroot.sh later on. Remounting /root rw manually works. * We booted with init=/bin/sh and Brian did run manually all the scripts in /etc/rcS.d. The scripts were successful and / became rw as expected. * Yet when booting in single user mode the above mentioned errors did appear and / was ro. Brian, feel free to correct me if the above is inaccurate. I have experienced somewhat similar. In my case errors are not always reproducible and generally manifest in late stages of rc2.d (gdm). I managed to get some logs off one of the crashes that was less debilitating. The issue seems related to the sysctl settings modified by /etc/init.d/lupin-sysctl. Uninstalling lupin-support should make the system work again without hick ups. The sysctl settings were suggested by Szaka in order to minimize the effects of hard reboots with nested filesystems (where the nested fs journal is at risk of becoming corrupted because of data loss in the host fs) and used to work fine with older kernels. We should reassess whether it is appropriate to keep such settings and investigate whether some of them are incompatible with the current kernel (as it seems). The kernel division by error is perplexing. I need to add some diagnostics into the kernel and see why the denominator is zero - looking at the source it is not straightforward - there are some time decay process values that produce the denominator and they should in theory be > 0. Will try to reproduce and figure out a fix or appropriate work around. I've dug into this and come across several unexpected issues with the tweaks to the vm settings which could be causing the corruption. and reading it back: sysctl vm.dirty_expire_centisecs returns 0 and not 1. This is due to conversion between USER_HZ and HZ to store the value in terms of the jiffy clock and then back from HZ to USER_HZ to read the value back out. I therefore suggest anything below 2 may be problematic in not being set correctly. See the next item. 2. Setting dirty_writeback_centisecs to zero actually turns off the periodic write back (pdflush is stopped) - definitely not what we want to do. 6. When the PC shuts down or reboots, is it possible to force a sync before umounting the loopback device? Forgot to say that I am still trying to figure out why the kernel division by zero error occurs in code where the denominator is never actually zero. As yet, I cannot reproduce this error. Has anyone a Win XP CD + valid license so I can do a Wubi install and reproduce this error? OK, I seem to have a handle on the real problem now. Basically the final umounts of the filesystems is probably not working correctly on shutdown/reboot causing the ext3 loopback filesystem to get corrupted. I think what is happening is that the NTFS filesystem is being unmounted before the looped back ext3 filesystem on that NTFS filesystem and the of course the ext3 filesystem cannot be umounted correctly and then the corruption found on the next reboot. 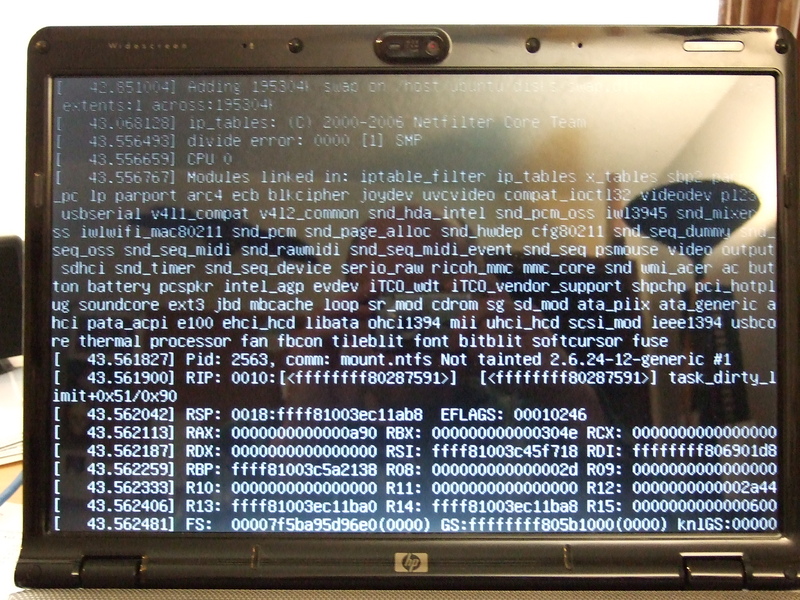 The kernel panics we see are because of the severe corruption in the loop mounted ext3 filesystem. I've managed to reproduce this on my system in a way that happens every time, no matter what kind of vm dirty flags are being tweaked. The vm dirty flags cannot work around such an issue - I believe somebody with better knowledge of Wubi and the Ubuntu shutdown process than I needs to investigate this. In summary: Make sure the ext loopback file systems are umounted before the NTFS filesystems. The loopback filesystem (file containing ext3) contains /, so that is never really unmounted, only remounted r/o in /etc/init.d/umountroot. As for /host (ntfs filesystem containing the root loop file) that is not even set r/o. A patch to remount /host r/o is in #186114, but was not applied since Szaka mentioned that remounting an ntfs r/o can lead to data loss (#186117). Do you think that we should proceed and have /host r/o? Would that be sufficient? where sdaX is the ntfs partition. Note that at the moment, as mentioned above, /host is NOT remounted r/o in umountroot. You may want to apply the patch in #186114 and test that. Also I have to double check the ordering in which filesystems are remounted ro in umountroot. The correct order is inverse order of /proc/mounts. Colin, about point 4 above, are you sure I should add the sync options to the loopfile mount? I would have thought that I should have had sync & co for the host filesystem (ntfs) but not for the nested one (ext3 in loopfile). The idea being that the data should hit the metal when the nested fs syncs, so it is the host fs that has to avoid caching. Caching in the nested fs is not necessarily a bad thing. Have attached above a couple of files to test. The first one is a new initramfs with sync mount options (replace /usr/share/initramfs-tools/scripts/local and rebuild the initrd). The sync options are for the host filesystem as opposed to the nested one (see above comment). The other file is /etc/init.d/umountroot. I tested it, but it does not seem to manage to remount /host (ntfs-3g) ro. I get the error "Remounting is not supported at present" (see bug #186117). One way to test is to disable /etc/init.d/reboot and then run sudo reboot. If /host cannot be remounted (as it seems) a solution might be to modify /etc/init.d/reboot so that if a root or a host filesystem in rw mode is detected, it will create a ram disk with /sbin/reboot and any other file that might be required at that stage, unmount / and /host, and reboot. Colin, was that what you hinted at on IRC? Would something like that be reasonable? I think was thinking this may be a via solution. Not sure how one does this in practice though as I am not really familiar with this part of the shutdown process and if one can umount /. Can one use pivot_root to twiddle things around to get access to /host? Needs some exploration I believe. and looking at the output from dmesg will show that the data is being flushed out. There still seems to be a bit of delay in fully flushing blocks out with the suggested sysctl's. I've fiddled with various settings but I could not seem to improve things. A couple of things I wanted to mention. 1) In the CD lupin-sysctl is not installed, so in the first reboot the sysctl hacks are simply not used. The sysvinit scripts are identical. 2) In my case I had to reboot several times in order to get a situation where I could access the logs, and in a few cases I had more severe locks and had to use alt+sysrq+r+s+u+b (possibly also hard reboot) and all that was in vm which has been mistreated in the past. All this to say that fs corruption might have already been there to begin with and may or may not be a casue of the locks. So to summarize it seems that sysctl setting do have an important role in addressing the original poster error. It is uncertain whether such sysctl settings do actually help in preventing fs corruption (in hard reboot scenarios and in normal reboot scenarios). It is uncertain whether fs corruption is a possible outcome of a normal reboot, but from your tests it seems not (was that with or without sysctl hacks?). I tested installing from an Ubuntu amd64 daily, 20080411, and was able to boot an install without any hacks. 1. Blocks in the loopback device that have yet to be written to the filestore (pending block I/Os). 2. Blocks that have been written, but not yet flushed by pdflush to the underlying disk. 3. Blocks pending in the disk cache (in the drive itself) that have not been physcially written back. Point 1 cannot be solved by sysctl style tweaks, and must be addressed in the loopback device. However, there is no provision for this in loop.c. It appears that the loop back threads are running at maximum priority, but there is some time lag between blocks being written to the loopback device and the blocks being pushed out by these worker threads. Point 2 is address a little by sysctl tweaks, but there is still a few centisceconds worth of latency between blocks being written and the blocks actually being flushed to the device. So, in the case of catastrophic power failure, the loop backed ext3 filesystem is evidently more vulnerable to file system corruption than the normal non-looped back filesystem. Thanks again for your very helpful insights! I was aware about the nested filesystem vulnerabilities in power failure scenarios, not from code analysis, but from "empirical evidence". And that is in fact stated in http://wubi-installer.org/faq.php (requirements > any gotcha). I am mostly interested in a reasonable set of sysctl/mount args to minimize said risks (given that they cannot be eliminated completely). And also to ensure that there is no data loss of any type in a normal reboot (via rc6.d). In that respect, do you think there is anything we should change to improve the situation? The new initramfs/umountroot will not be used since at this stage it is my understanding that they do not change much (extra mount options are ignored by ntfs-3g and /host cannot be remounted r/o). Evan already added your sysctl suggestions to lupin and they are in the new ISOs. In fact they seem to be enough to "close" the original bug! Anything else we should consider? Thanks for the link to the discussion, I missed that one when I looked at the loop device this morning. I think these a rather "radical" changes so late in Hardy, for example, one of the listed "disadvantages" impact loop encryption which some users will definitely miss. However, I think it's well worth considering this kind of approach for Hardy + 1, especially as these changes may be incorporated officially upstream with the necessary modifications to handle loop encryption. Changed to "fix released" for Wubi (8.04) since Brian's problem was addressed by Colin's suggestion and it seems there isn't much else to be done in this release . Work on loops and ntfs-3g remounts will be resumed in intrepid (possibly via separate bugs). 2. modify ntfs3g with the attached debdiff which adds a -o syncio mount option to open the NTFS device using O_SYNC, e.g. this makes all ntfs dirty writes to get written back synchronously. I've tested an ext3 file system mounted via the loopback with -o sync (point 1 above) and used my patched ntfs3g with the -o syncio mount option and using vmstat 1 shows that I/O is flushed immediately, reducing the possibility of file system corruption on power outages. Colin, that is fantastic, I think we should try to have it in hardy.proposed as this is a clear improvement over the sysctl hack and should better address data loss situations in hard reboot scenarios. One question: I can certainly appreciate the value of quick syncs for the host filesystem (2), but why do we exactly need -o loop,sync in the nested filesystem? Is there any benefit for that? My understanding is that if the host flushes quickly, the nested journal should be safe, whether the nested fs syncs quickly or not. Szaka, would it be possible to merge Colin's patch above within ntfs-3g? <xivulon> any idea of the performance hit for that? <cking> My tests showed -o sync on the loop was 1/3 to 1/2 slower. But I did just raw block write tests using dd. Normal usage may differ. * Was this ntfs-3g patch sent/ack'ed upstream? Is it fixed in Intrepid already? My understanding is that Szaka is aware of the patch and that it will be incorporated upstream possibly with some additional modification. It is unclear though whether that will be done in time for Intrepid. Colin will probably prepare a patch for intrepid to be used if the upstream version is not ready in time. 2) they were not always "well tolerated" as the original bug report shows (comment #17), the values used at present are less strict because of that and while I haven't seen any complaint I cannot exclude that the issue is still lurking. I am sure that Colin can clarify it further. Thanks for the clarifications so far. What about the "linux" portion of that bug? I take it there is still something to be fixed in the kernel? Do we need a fix in hardy as well, or is the workaround in ntfs-3g sufficient? I'll wait for upstream's ack, then I'll sponsor that. 1) The "linux" bug mentioned in comment #17 is relevant for low levels of dirty_ratio. The ntfs-3g patch will avoid lowering the dirty_ratio and will indirectly help (which is a subcase of #2 above). 3) It would be nice to be able to use the standard mount option name "-o sync" as opposed to have to create a new one for each filesystem "-o syncio". Not least because it will create a bit of special casing in other code (lupin/initramfs-tools). From a past discussion with Colin it emerged that the naming was to work around fuse -o sync handling. 4) There is also a remount issue with loopdevices (see #201750). On top of that, there are separate remount issues for ntfs-3g (see #186117), even worse, it seems that remounting ntfs-3g ro/rw can produce data loss (https://bugs.edge.launchpad.net/wubi/+bug/186117/comments/10). Not sure if newer versions of fuse/ntfs-3g address this. 5) Related to the above there are the shutdown issues mentioned by Colin in comment #19. I am not sure what is that state of that given A) the ntfs-3g patch and possibly B) dm-loop usage. triaged to Confirmed or Invalid/Wontfix. > 1) The "linux" bug mentioned in comment #17 is relevant for low levels of dirty_ratio. The ntfs-3g patch will avoid lowering the dirty_ratio and will indirectly help (which is a subcase of #2 above). Correct. The dirty ratios are at best a dirty hack, and when pushed to their limits, do show up some problems - which I don't think are appropriate to workaround in the kernel. The correct approach is to avoid the sysctl's on the dirty ratios and hit the crux of the problem and that is to make sure that ntfs-3g is flushing data using the O_SYNC open() flag rather than forcing it using some very aggressive vm tweaks. I think that patching the loopback is more of a technical risk than using dm-loop. I think it's a case of getting Wubi working with dm-loop and comparing performance with the normal loopback and making a decision based in reliability and performance. As yet, I have no hard facts to make a decision either way on this. I suspect dm-loop will help with #1 in https://bugs.edge.launchpad.net/wubi/+bug/204133/comments/31 from my understanding of the code, but I have not verified this in practice. > 3) It would be nice to be able to use the standard mount option name "-o sync" as opposed to have to create a new one for each filesystem "-o syncio". Not least because it will create a bit of special casing in other code (lupin/initramfs-tools). From a past discussion with Colin it emerged that the naming was to work around fuse -o sync handling. Correct. For the -o sync fuse option to work, there needs to be considerable amount of effort required in honoring the -o sync flag in the kernel side of fuse and being passed down and handled in the user space side too. The simplest option was for ntfs-3g to pick up the -syncio option and handle it there rather than add generic -o sync support in fuse per se. > 4) There is also a remount issue with loopdevices (see #201750). On top of that, there are separate remount issues for ntfs-3g (see #186117), even worse, it seems that remounting ntfs-3g ro/rw can produce data loss (https://bugs.edge.launchpad.net/wubi/+bug/186117/comments/10). Not sure if newer versions of fuse/ntfs-3g address this. > 5) Related to the above there are the shutdown issues mentioned by Colin in comment #19. I am not sure what is that state of that given A) the ntfs-3g patch and possibly B) dm-loop usage. I suspect that the sync'ing of data with ntfs-3g will help considerably in ensuring that the data is being written back. My hope is that dm-loop will have less latency between writes to the loopback and data being written back than the normal loopback. It appears it should be better, but we need to test this hypothesis. Attached is the same modification as a debdiff for the Intrepid version of ntfs-3g. Can this be applied too? Colin, FUSE doesn't support sync(2) but the 'sync' mount option should be ok because FUSE writes are always synchronous at the moment. Your patch fundamentally solved ntfs-3g 'sync' support minus some issues (cached metadata, disk caching, propagating the sync option to FUSE, portability, maybe others). The patch is planned to be applied with some modifications within about a month as 'sync' mount option support. Could you please point out where sync(2) is needed in FUSE if this is the case, or what do you mean it doesn't support what would be needed for more reliable WUBI operation? I think this would be a strong reason to raise the implementation priority. The 'sync' performance impact is 20-3,000% depending on the workload but it was never more than 200% during normal usages. The reason for the O_SYNC option in the open on the NTFS device was mainly to ensure Wubi was writing data back to NTFS. Wubi relies on a loopback'd file system in a file in the ntfs fileystem, and hence there was a lot of latency between a write to the loopback, down through the ntfs filesystem via fuse. We were seeing problems with power-outages causing systems to become unbootable due to the write-back cached data latencies. One hacky approach was to tweak the vm settings to force writebacks as soon as possible to avoid blocks hanging around in the cache - this was a hack and not an elegant solution as it applies to all file systems across the board. Hence I added the O_SYNC option to ntfs-3g avoid this hack. Basically we ultimately need a method of ensuring ntfs data and metadata is sync'd to disk asap to keep Wubi as robust as possible. As for performance penalty, I have also benchmarked the SYNC mode of operation and it is inline with the figure your report. This is probably OK for Wubi since most of the I/O operations are read and not writes, and I suspect robustness is more important than speed - but it will probably be an choice that the Wubi user can make. I will have to try again today to confirm, there might be something wrong with my testing rig. Not sure yet what is different since last test (might it be that then I forgot to upgrade libntfs3g?). Can somebody else try that too? I was struggling to get a speed of 2.6 mb/sec with syncio enabled. However I was getting transfer speeds of <21 mb/sec without syncio enabled. Ago, is Wubi using the normal loopback or dm-loop in this configuration? And what are we using the default vm sysctl's here, or are we using the Wubi vm sysctl's hacks too? a 6 GB data file on ext3 file system on the loopback. Results are averages of 3 tests. best performing which is totally unexpected. Now for some real-world file transfer tests. test copied 26,438 files and 647MB of data. performs better than in async mode, which is most unexpected. intrepid kernel source git tree of 26,438 files and 647MB of data. ..one more thing... my formatting of the benchmarks was completely messed up by the webform! Colin, my results above are completely independent of Wubi. The test was done using a standard intrepid installation and mounting ntfs from there with and without syncio. 1. ntfs-3g mount with syncio is indeed 10-12x slower than the default async ntfs-3g mount. 2. However, if one has a loop-back or dm-loop backed ext3 filesystem inside this then problem is less of an issue due to the buffer-caching at the ext3 layer - essentially the buffer cache at this layer will improve performance significantly. 3. Having ntfs-3g mounted as syncio is only useful with the ext3 filesystem loopbacked inside it to make sure that ext3 writes get written back through the fuse layer. At umount time of the looped back filesystem or calling sync will ensure that the files in the ext3 system are written back correctly to the ntfs-3g fuse layer. 4. Without the syncio mount option, we may see the ext3 filesytem get corrupted if the ntfs3g/ fuse writes are not fully written back to the ntfs filesystem. I am unsure how Wubi initialises the filesystem during the Wubi install. However, if you are copying an ISO image or large amounts of data over to the ntfs-3g filesystem perhaps mounting it at first without the syncio option is fine. However, once Ubuntu is up and running from a ext3 filesystem which is loopback mounted inside ntfs-3g then a syncio mount option is probably the best way to make sure data is sync'd back correctly to reduce ext3 inconsistency and with enough buffer cache it should perform reasonably well. Thanks a lot Colin, on my side I had already committed the required Wubi changes (rev 508), but was on hold because of the above, I will bring it to the attention of the Ubuntu-Installer team. already installed since syncio also requires a change to menu.lst. Presumably, this should be fixed before the 8.04.2 iso respin. Reviewing this bug report which still needs SRU verification I don't see a clear test case. Agostino - what needs to be done so we can verify this bug fix? - Add udeb shlibs entries for libntfs-3g28-udeb. - Create libntfs3g28-udeb and ntfs-3g-udeb. - Move ntfs-3g to /bin. - Move libntfs-3g.so. * to /lib. Adjust libntfs-3g.so symlink to match. - Add /sbin/mount.ntfs symlink to /bin/ntfs-3g. - Add a symlink for the mount.ntfs manual page too. /dev/.initramfs/varrun if necessary (LP #150831). - Always add ntfs and ntfs-3g to sendsigs.omit (LP #181669). * Urgency set to HIGH because it fixes a critical issue. * New upstream release (Closes: #479774). * Bump library package name to match current soname. Can someone who is affected by this test this out? I've tried to reproduce the problems using Agostino's recipe described in https://bugs.launchpad.net/wubi/8.04/+bug/204133/comments/21 but was unable to reproduce the problem (I successfully set up a system to boot off of a loopback mounted ext3 filesystem that resided on an ntfs filesystem). That said, I didn't see any issues while using ntfs-3g from hardy-proposed. I installed Ubuntu 8.04.1 amd64 using wubi in Windows Vista and was able to boot the installed system successfully. I ran the testsuite from http://www.ntfs-3g.org/pjd-fstest.html referred to in Martin's comment in bug 229000. I saw no difference in output when using the version of ntfs-3g in the version released in hardy-updates, 1:1.2216-1ubuntu2, as opposed to the version in hardy-proposed, 1:1.2216-1ubuntu3, either with or without the sync mount option. I subsequently ran the testsuite repeatedly while also running iozone in auto mode against the version of ntfs-3g in proposed, and saw no corruption or other negative behaviors; once again, I did this twice, with the filesystem mounted with and without the sync option. As far as I can tell, this doesn't introduce any regressions. What is the output of cat /proc/cmdline? It seems like upgrades from earlier wubi-installations (<9.10) are effected. This happens every time and I have to hard shut down the PC using power button. I hibernated Ubuntu and now it is unbootable. I have "kernel panic not syncing VFS unable to mount root fs on unknown block 8,1". I have data hidden in ubuntu, how can I get it? If it is an ntfs corruption issue, you can run chkdsk /r from windows on the drive containing the ubuntu installation and then try to boot again. You can access your data by booting from a linux live CD / USB, then mounting the appropriate windows partition, then mounting the /ubuntu/root.disk file therein using the -o loop mount option. I have the same problem in 14.04 and do not know how to rsolve it.